Ivan Ivanov, paint removal technician, removes temporary woodland-green camouflage paint from a High Mobility multipurpose Wheeled Vehicle at the Grafenwoehr Training Area Oct. 24, 2017. The paint was originally applied in February 2017 as the 3rd Armored Brigade Combat Team, 4th Infantry Division settled in for rotation at USAG Bavaria in support of Operation Atlantic Resolve. GRAFENWOEHR, Germany — After nine months in Europe supporting Operation Atlantic Resolve, the 3rd Armored Brigade Combat Team, 4th Infantry Division’s fleet of combat vehicles are removing their temporary woodland colors and reverting to their original desert tan in preparation for the trip home to Fort Carson, Colorado. The vehicles were painted green at the beginning of the unit’s rotation under the guidance of U.S. Army Europe’s Commanding General, Lt. Gen. Ben Hodges. Before the guidance from USAREUR’s top commander was issued, the vehicles were simply draped in green camouflage netting to partially disguise their tan paint. 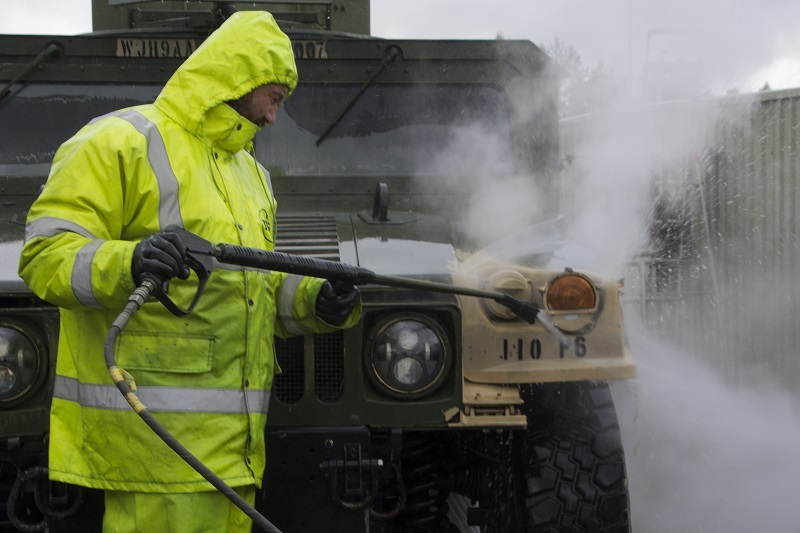 “Once we received guidance from Lt. Gen. Hodges, we looked at the available options that would reduce the cost and time required to paint vehicles,” said Maj. Darwin Maull, deputy chief, Plans and Operations, U.S. Army Garrison Bavaria. The traditional painting method is a costly one – both in time and money, said Maull. It can cost nearly 5000 Euros to paint one vehicle, take 4 or 5 days to paint, and require contractors to apply that paint. “Rotational forces are on the ground for approximately nine months,” said Maull. “Spending two weeks of that time on painting would reduce the time they are available to conduct training in support of their operational mission here in the European theater. USAG Bavaria looked at the different methods used by other militaries and the Army’s sister services and chose a method that uses a temporary paint, saves more than 1000 Euros per vehicle, and cuts the painting time down by several days. Stewart Donnelly, paint removal technician, removes temporary woodland-green camouflage paint from an M149 Water Tank Trailer at the Grafenwoehr Training Area Oct. 24, 2017. The paint was originally applied in February 2017 as the 3rd Armored Brigade Combat Team, 4th Infantry Division settled in for rotation at USAG Bavaria in support of Operation Atlantic Resolve.